I took a little break from blogging, but I was able to do some quilting. I had promised myself to do nightly 15 minutes of sewing and I have done that but just barely. The mad house which is my home right now has prevented me from working on my baby gift. I have been able to work on a UFO that I started in 2009 and never got very far with the quilt. A group of us started making 3 inch Nine Patches to exchange but when we went to exchange I realized I did not like their fabric and they did not like mine. I also think there were some technique and quality control issues…. YOU know 3.5 inch patches that were not 3.5 inches. We came to the agreement to keep our own patches. I revised my plans for my patches when I went through my folders of magazine clippings. 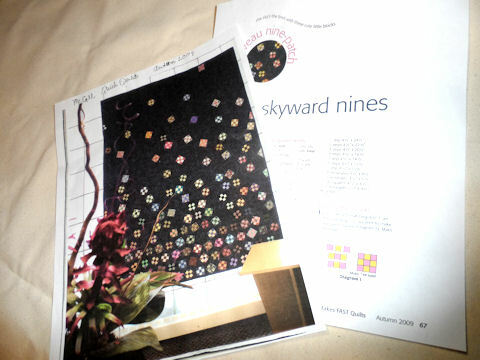 I found a picture of a Nine Patch quilt I always admired. I decided to make it… only bigger. For the past two weeks I have been doing MINDLESS SEWING. 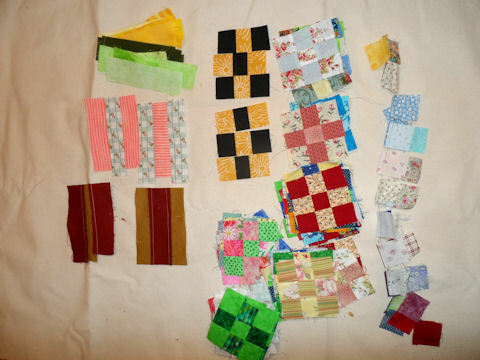 In that I have scrap bags of left over fabrics and have been cutting them into 1.5 by 5.5 strips. I then sew them into NINE PATCHES. Any small chunks get cut into 1.5 squares then sewn into a scrappy nine patch. I currently have over 200 nine patches but I need over 200 more. So every night after dinner I am trying to sew for 15 minutes. What I am finding is that the 15 minutes stretch into an hour. I think I have made good progress. I call this mindless sewing because I am not being 100% fanatically careful with these patches. A lot of my seams do not match up. They are kind of wonky. The strips came from previous projects I had made and some of my patches will be smaller than the 3 inched finished. I am doing a lot of fudging of the blocks to get them made. I am in a USE WHAT YOU HAVE FRAME OF MINE. I will be making up for size difference when I add the sashing to the quilt. As a matter of fact I am thinking of deliberately making some odd size blocks as I think they will add to the whimsy of the quilt. I am having a lot of fun making these blocks. The picture I am including is the steps to making the four patches. Cutting the strips and 1.5 inch patches. Chain piecing. I am sewing many of them in the standard four and 5 patch setting but I am also mixing and matching my block depending upon the fabric available. I am starching the heck out of the fabric because I am having some difficulty keeping the patches straight. For some reason some of my fabric wavers. I think the scraps might not be on straight of grain. 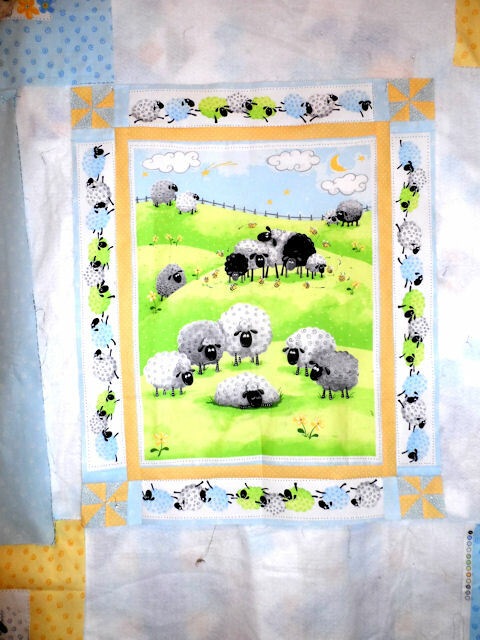 On my design wall I have the sheep panel for a baby quilt. I was able to work on this weekend. I have been adding borders to the quilt. Since I am trying to do the best I can this takes a little more time than usual. I bought the panel and coordinating fabric six months ago, and of course the local quilt shop does not have any more of these fabric. I have been trying to adjust the running sheep border to the quilt. I ended up cutting the ones on the top and bottom and adding the pinwheels. I used a slightly different shade of blue fabric that mimicked the swirls in the other fabrics. I have been trying to be very careful to get the panel square and the quilt top flat. So far so good. Right now I am pleased with what I have done. Hopefully this week I will be able to work on it again this weekend. I will not be podcasting for several months. I have had to down size my service and am at maximum file storage for another month or two. I could not afford the upgrade to the new program (It was over $300 to maintain the program I had last year and I can not see spending the money for what is a luxury but not necessity.) I understand the need for the podcast services to make money but I can not afford to continue. The other reason I am not podcasting is lack of time. The actual recording time was about one to two hours but then I usually spent 4 to 8 hours editing. FRANKLY I would get tired of hearing my own voice and it was boring work. Time I do not have as my grandson grows older and wants more attention. Playing HEADBANZ and board games or crashing cars is my idea of fun. I also found podcasting ate into the free time I had for quilting. What a conundrum I could talk about quilting or I could quilt. With the amount of UFOs I have accumulated the answer to me is obvious… hit that sewing machine running. I am sorry I was not able to make an announcement of the demise of the podcast. I do hope to continue with quarterly podcast once my service site gets adjusted but I do not know when that will be. I will be continue with this written blog and hope to post more often as I quilt. I see this as my quilting journal. No one in my family wants to hear about my quilting so I look to you my listeners and blog readers to converse with. Looking forward to a prolific quilting year.